It’s not the biggest shawl I’ve ever knit, but I think it’s the most beautiful. I won’t be able to wrap my entire body with it on a cold night, but it’s cozy just the same, because a dear friend will get to wear it. Plus, my uber-cozy Ene is coming soon, all the way from Seattle! Let’s take a little peek (hee!) at this gorgeous combination of yarn and pattern. Pattern: Ene’s Scarf by the venerable Nancy Bush from the Scarf Style collection. Yarn: directly from the hands of the Master, Sundara Yarn Somewhat Solid Silk Lace in Wine with Violet. Needles: INOX aluminum/grey US 0 (2.0 mm) circs, 24″ long. These weren’t my absolute favorites, but they got the job done. Finished size: 40″ across the top, and 21″ from top edge to point. Thin yarn combined with tiny needles = a very small scarf, indeed. Though Sundara’s silk comes in hefty 100 gram skeins, this scarf took up only a fraction of that amount – 39.0 grams, about 400 yards. On top of that, I blocked very gently by steaming the fabric and spreading the lace with my fingers – Sundara and I agreed that we wouldn’t over-stretch the lace, in an effort to avoid that stiff silk feeling. Steam-blocking worked wonderfully, and the scarf came out soft and supple. I’ll be the first to admit that this blocking technique could have vastly improved the final appearance of my wafer-crisp Fir Cone scarf. How can I tell when I’m truly entranced with a project? When I can’t narrow down the photos to include in the FO report! When a “mistake” photo (you’re seeing the wrong side) is so beautiful, it inspires me to explore more: shadow and movement in the wind. Enjoy! Beautiful! You have a very lucky friend. It is gorgeous! Yay for all the pictures that you shared too! Love all the movement in the photos. Fly, be free, little shawl, in your silky drapiness! So gorgeous against the sky. Oh, that color is so pretty with that pattern. sigh… so beautiful. This has to be my most jealousy-inducing swap EVER (because I’d love to get get a knitted gift from you or purly). I will have to try steam blocking on my next silk project! Flipping gorgeous! What’ll you do with the rest of the yarn? That is so foin, G! What would we do without your example? Beautiful. I can’t wait to see your Ene as well. I am the luckiest girl ever! Stunning. It is a gorgeous specimen of lace. Beautiful. I love the photo of it against the sky, especially. It is so perfect with your grey jacket, I think you should keep it. Oh, how gorgeous! 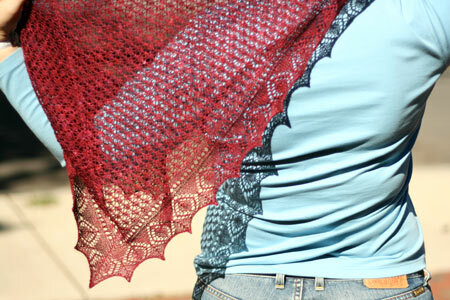 Simply a beautiful shawl! Lucky friend. The shawl is awesome, and I love the color. Beautiful! I did cast on for this two days ago, but havent got more than half of the border pattern knitted. Inspirational to see yours! Oooo….this pattern must go on my list now. This is so beautiful and the color is absolutely gorgeous! Gorgeous! I love the photography. It’s truly beautiful and your pictures are outstanding. It IS beautiful! I love the Knit Picks needles for lace now. That is gorgeous. I can see why you love it so much. The recipient will be thrilled! Lovely. And your photographs are equally splendid. This is a shawl I have been contemplating for a while now with a random ball of laceweight yarn snagged at a sale and it’s wonderful to see the way it moves and looks in the light. Finally it’s done! Wow, beautiful!! Gorgeous! I love the red/violet color. The details in the pattern stands out more than if it were done in a heavier yarn. Great FO! 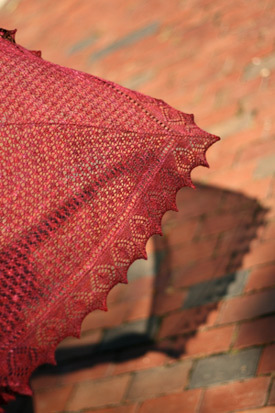 I think this pattern is pretty, but with the yarn you’ve chosen it is absolutely stunning! That is truly lovely. Thank you for sharing it with us, as well as the yardage it took. I love the pattern and keep staring at differernt yarns thinking, are they Ene worthy? Love it in the silk. So lovely – and your photos are just amazing. That’s an awe inspiring shawl Grumpy! I’m so glad I joined Sundara’s yarn club, I’ve been wanting to try this silk lace but I can never decide on a color — it’ll be easier to just be surprised. 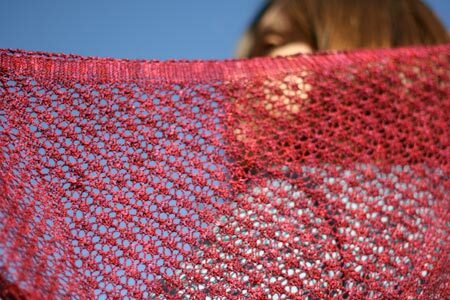 I love how delicate the shawl is — it’s beautiful! Simply gorgeous! Sundara is a color genius and you make-great-shawl 🙂 Thanks for sharing the pics! It is gorgeous! The recipient is lucky indeed. 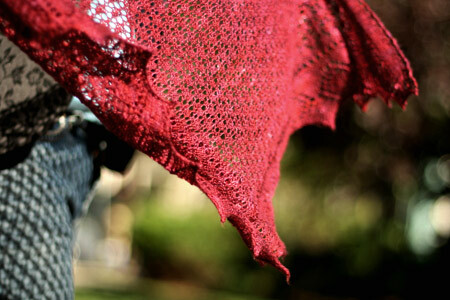 The shawl is lovely, and so are the photos! I particularly like the one with the shadow on the wall. It’s beautiful! And based upon the yardage, it can be added to those patterns that will work with Sea Silk. once again a lovely job!! beautiful photos too! I have some sundara lace around here I need to get that out and on some needles! Beautiful! Great photos, too. I especially love the one where lovely Ene is flying against a blue sky. Wow! Is that ever gorgeous! Entranced is just the right word. It’s so, so, so, exquisite. So very beautiful and elegant! Great pictures, too. Very inspirational project, thanks so much for sharing. So very, very gorgeous… 🙂 Sundara’s lucky to be on the receiving end of this deal! Wow! That is absolutely gorgeous! I absolutely adore the colour – and the pattern is divine. I can see that this will have to move up my list. Thanks for the inspiration! Awesome job on the photo shoot. I think S. will be pleased with the scarf. Of course, your work is amazing as always. That Yarn looks like Heaven! Thank you for the information on blocking Sundara’s silk. I’m working on Peacock Feathers and was getting worried about how best to block it. I’ll try a combination of pinning gently and steam so the silk doesn’t go stiff or lose it’s luster. You keep making my favorite projects! I’ve wanted to knit that linen tablecloth since I first saw it, the scarf you chose is the best in that book, and this is my favorite of the shawls. Excellent! I love the photo with the shadow! 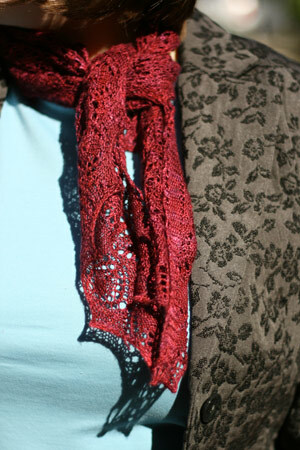 Beautiful scarf/shawl, and thanks for the tip about blocking silk. 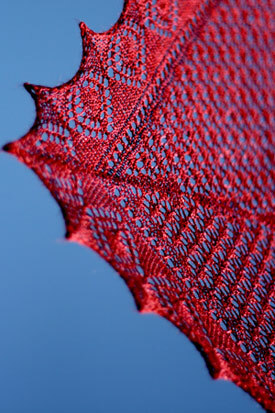 I’m just getting into knitting lace, so I’m soaking up all of the tips I can. I love that deep red color. Very, very lovely. The color is great and the workmanship exquisite. That really is a beautiful scarf! That’s just breathtaking, especially when combined with that juicy red from Sundara. That shawl is amazing, great job with all the great FO’s!